Like many coffee lovers we were excited when, in the fall of 2008, two Starbucks stores opened at Amsterdam’s Schiphol Airport. While there already were some Starbucks stores in the Netherlands, these two are the first that are open to the general public. Both stores are located before passport control, within Schiphol Plaza — the airport’s shopping center. Since the stores opened we have had a number of opportunities to sample their wares. Â© Copyright DutchAmsterdam.nl. Want to use this photo? It could be that this is a case where absence made the heart grow fonder. The memories of good Starbucks experiences elsewhere may have set the bar of our tastebuds’ expectations a little too high. Granted — we’re coffee connoisseurs used to perfect macchiatos, cortados, and the incredibly good coffee drinks at Lungoccino, the Amsterdam coffee house that received high praises from noted Dutch food critic Johannes van Dam. So while successive our experiences with the coffee from the Starbucks stores at Schiphol was anything to write home about, we nevertheless returned a few times, figuring next time things would be better. Mind you, we’re talking about 2 visits to Starbucks Arrivals 2 (across from Burger King and facing Schiphol’s main hall), and 7 visits to Starbucks Arrivals 4. We’d say we gave it a fair shot. The reason we visited the Arrivals 4 location more often is that it offers an extensive seating area. On each of our visits we have forsaken the dozens of plain wooden tables and chairs in favor of the more-comfortable looking stuffed chairs. Eight or so of these are found in a cluster near the service counter, and more stuffed chairs are located in a separate, but open room to the side of the store — the only place where music is piped in. On our last visit (and I’m afraid that by ‘last visit’ we really do mean final visit) to this Starbucks store, we marveled — as we have done before — at just how many people they’ve got working behind the counter. The girls sitting next to us remarked on this as well. At one time we counted 7 (seven) people behind the counter. Who knows, they may have just finished a strategy meeting or something like that. But apparently neither the folks behind the counter, nor two people who busied themselves refilling the sugar supply and straightening some chairs, considered cleaning off tables to be part of a good strategy. During our 50-minute visit the table next to us — again, in plain view of the counter — was used by three sets of guests, all of whom left more empty cups and plates. That said, it’s the quality of the coffee drinks that has us more puzzled. Despite our dedicated optimism that surely, this time it will be better than last time, our coffee drinks — regardless of which ones we ordered — were, in our opinion, just not good. It’s not that were hard to please, but we do expect good quality coffee drinks — certainly at the prices Starbucks charges. What we got instead was of a consistently poor quality. Starbucks is peddling the worst coffee at the highest prices according to a survey of the big three coffee houses on Britain’s high streets. Starbucks sells coffee that is poor quality and over-priced, according to a survey of cafe’s. The biggest player in Britain’s £900m-a-year coffee shop industry offers blander drinks than its competitors Costa Coffee and Caffé Nero and is costlier than most rivals, testers for the consumer group Which? reported. We do have some pet peeves as well. For instance, when we order macchiatos, what we expect to get is the traditional centuries-old Italian drink that consists of an espresso with a drop or so of milk (the ‘mark’). True, at some point, baristas started adding a small dollop of foam so that waiters would be able to tell the difference between an espresso and an espresso with a drop of milk in it. But then the Americans got a hold of it, and soon their fascination with big servings resulted in them slapping the name macchiato on a huge latte that bears no resemblance to the original beverage. Upon our surprise at the big mugs we checked the receipt, which said we paid for ‘2 Grande Caffe Latte.’ When we pointed out that we wanted macchiatos we were told we should have ordered an ‘espresso macchiato.’ On the contrary, if Starbucks wants to uphold its thin layer of Italian veneer, do it right in the first place. By the way, if a customer asks for a large version of whatever, just say ‘large or extra-large’ instead of arguing (as we have heard several times) with him about ‘grande or venti.’ Avete capito? Finally, the more people there are behind the counter, the more tempting it is to pay more attention to each other than to the customer. In one experience at the Starbucks Arrivals 2 store the girl serving me spent almost the entire transaction talking with — and looking at — some corporate type(?) standing next to her. At the Starbucks Arrivals 4 location people have been friendly enough to at least look at us, but on several occassions talking among each other apparently was more important that paying a little more attention to the customer. 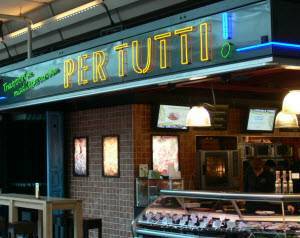 We’ve learned our lesson, and next time we’re at Schiphol we’ll have our coffee drinks at an old favorite: Per Tutti. Yes, an Italian store that serves anything from fresh-baked croissants and delicious coffee drinks to freshly prepared Italian meals to take home. 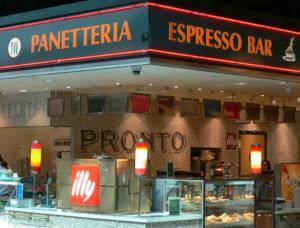 Per Tutti is located just around the corner of Starbucks Arrivals 2, across from Burger King. Catty corner from Per Tutti is the Pronto Italian Ice Saloon, serving fine Italian coffee drinks as well. The small Segafredo Café in the meeting & greeting area of Arrival Hall 2 also serves tasty coffee drinks. Will we really not give Starbucks another chance? Of course we will — but later rather than sooner. Well… we did return to Starbucks Schiphol — several times, even — visiting both the location in the main hall and the one at Arrival Hall 4. Moreover, we also visited Starbucks at the Sloterdijk train station and the one at Central Station. We visited a total of seven times in addition to our earlier visits. I guess we did so out of sheer dedication to our readers — because we certainly did not return for the coffee. What can we say? We did not set out to dislike Starbucks. In fact, we were as happy as many other folks when Starbucks finally opened some stores here. But we were disappointed with the coffee from the start. True, there are plenty of places in Amsterdam were you get a worst brew. But there are countless places where you get a much better cup of coffee — usually at a much friendlier price. Besides. If you visit Amsterdam as a tourist, why not enjoy the local scene? Visit a café, a coffee house — heck, even most coffeeshops serve better tasting coffee than Starbucks does. Our final Starbucks verdict: Still no stars; still too many bucks. Starbucks opens more stores in Amsterdam. Oy veh!